What hidden skill links successful people in all walks of life? What helps them make informed decisions, inspire creativity and forge stronger connections? Questions help us break down barriers, pinpoint solutions and explore new ways of doing things. But few of us know how to put questions to work in a truly effective way. 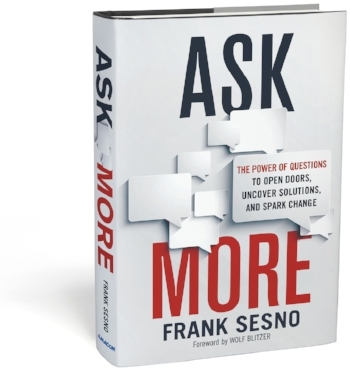 Author Frank Sesno aims to change that with Ask More, a guide to unlocking the power of inquiry that’s both intriguing and instructive. Ask More is packed with illuminating interviews and stories from dozens of leaders who have used these questioning techniques to innovate and excel. By the end of the book, you’ll discover what to ask and when, what you should listen for and how each different type of question will move you toward your goals. In an age of instant answers, fly-by facts and relentless clickbait, Sesno makes a powerful case for the value of observing carefully, listening intently and asking more. He reveals a roadmap to inquiry that will change the way you question – and that might even change your life.